Markov chain Monte Carlo, or MCMC, is a powerful family of search algorithms that has applications all over science and engineering. I’ll make the case that it gives us the material for a major breakthrough in the study of redistricting: how do you decide when a map has been gerrymandered? Math Lovers Forum at MSRI: Moon Duchin on “Random Walks and Gerrymandering” from MSRI on Vimeo. 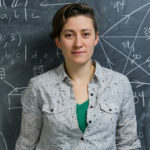 Moon Duchin is an Associate Professor of mathematics at Tufts University and serves as director of Tufts’ interdisciplinary Science, Technology, and Society program. Her mathematical research is in geometric group theory, low-dimensional topology, and dynamics. She is also one of the leaders of the Metric Geometry and Gerrymandering Group, a Tisch College-supported project that focuses mathematical attention on issues of electoral redistricting. Duchin’s research looks at the metric geometry of groups and surfaces, often by zooming out to the large scale picture. Lately she has focused on geometric counting problems, in the vein of the classic Gauss circle problem, which asks how many integer points in the plane are contained in a disk of radius r. Her graduate training was in low-dimensional topology and ergodic theory, focusing on an area called Teichmüller theory, where the object of interest is a parameter space for geometric structures on surfaces. Duchin has also worked and lectured on issues in the history, philosophy, and cultural studies of math and science, such as the role of intuition and the nature and impact of ideas about genius. She is involved in a range of educational projects in mathematics: she is a veteran visitor at the Canada/USA Mathcamp for talented high school students; has worked with middle school teachers in Chicago Public Schools, developed inquiry-based coursework for future elementary school teachers at the University of Michigan, and briefly partnered with the Poincaré Institute for Mathematics Education at Tufts.